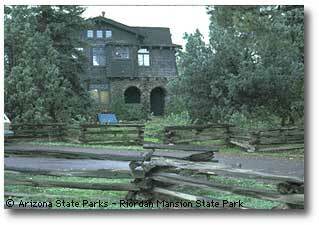 The Riordan Mansion State Historic Park stands tucked away among the Ponderosa pines of Kinlichi Knoll in Flagstaff, Arizona. This five-acre park, which borders Northern Arizona University, showcases the remarkable home of Timothy and Michael Riordan, lumber baron brothers who married sisters, Caroline and Elizabeth Metz. Together, the Riordan brothers built their thirteen thousand square foot mansion in 1904 while Arizona Territory still struggled toward statehood. The startlingly luxurious home consisted of two similar six thousand square foot wings, one for each family, connected by a large billiard room. Tim, Michael and another brother, Denis, were prominent Flagstaff businessmen. 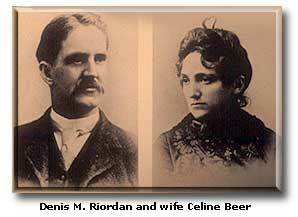 Denis, the eldest, went by the name “Matt” (his middle name was Matthew) or his initials “D.M.” The Riordans owned a large lumber operation, brought electricity to Flagstaff and built Lake Mary, which today provides the city with drinking water. Denis [Matt] eventually moved to California, but Tim and Michael remained active in Flagstaff's civic affairs and in the Catholic Church. 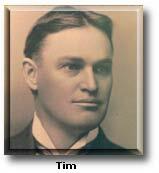 Riordan Mansion is now part of the Arizona State Park system and Tim and Caroline's wing is open for guided tours. The Riordan family donated the home and everything in it -- from the picnic basket in the back entry to the maps in Tim's library  to the park system. Touring the mansion, you feel as if the Riordans are at home while you're "snooping" through their house. The downstairs of the home of Michael and Elizabeth Riordan is now also open and included as part of the tour. It is set up with displays and intended to be a complement to the guided tour of the east house. The rustic mansion, built from rough, log-slab siding, hand-split wooden shingles and volcanic rock, blends perfectly with the rugged Flagstaff landscape. The home, designed in American Arts and Crafts style by Charles Whittlesey, who also planned El Tovar Hotel at the Grand Canyon, contains forty rooms, including six bathrooms called "indoor necessaries." Both families used the long Billiard Room, with its overhead log beams, as a recreation room. Most visitors claim this as their favorite room in the house. As the Riordan families were Flagstaff's high society, they doubtless entertained often in the grand room. Grand Canyon explorer John Wesley Powell's expedition photographer John (Jack) Hiller's photographs are printed on glass that make up the window panes in the Billiard Room. These unique photos provide a glimpse of early Arizona. One end of the Billiard Room holds an immense billiard table complete with crocheted ball pockets. Next to the hearth is a huge pair of wooden baby shoes, Paul Bunyan's, of course. Always the Irish storyteller, Tim Riordan loved to entertain visitors and children alike with his tall tales, and he used the shoes to convince them that he actually knew Bunyan. Not all of the times in the Billiard Room were happy. In 1927, Michael's oldest son, Arthur, and Tim's youngest daughter, Anna, died within hours of each other from the complications of polio. Since the disease was contagious, the Riordans held the joint funeral in the Billiard Room with only the family and the priest present. Most of the Riordans' memories were happy ones, however. Their sports equipment, painting collection and souvenirs help to define the personality of the family. At six-feet, three inches tall, Tim was a large, athletic, fun-loving man who was unusually progressive in his thinking. He loved to entertain, and in the dining room a football-shaped table allowed Tim to see all of his guests without craning his neck. 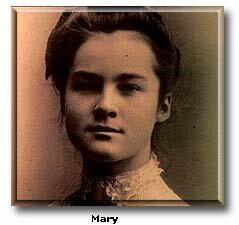 In the living room, a portrait of Tim's oldest daughter, Mary, hangs over the fireplace. As one moves about, her head and torso appear to turn and follow, but it's not a ghost, merely an optical illusion. Facing the fireplace, a green wicker swing hangs from the ceiling. In the summer, servants turned the swing around so the family could enjoy the window view. Novelties and conveniences exist throughout the house. Some windows and light fixtures contain Tiffany style glass, and in the center of the house, a light well allows sunlight and air to circulate throughout. The stair landing holds a small chapel with a hand-carved wooden statue, where visiting priests said Mass. In the kitchen, a six-door, self-draining icebox could be filled from the outside, making life easier for the cook. Caroline was as dainty and petite as Tim was tall and boisterous. In her upstairs sitting room, pretty dresses prove Caroline kept her twenty-two-inch waist throughout her life. In the custom of the day, she never came downstairs to greet visitors unless properly dressed. Caroline Riordan's beautiful, custom Steinway piano holds a special place of honor, a nook between the entryway and the living room, where guests in both rooms could enjoy the music. The Riordan home is furnished with exquisite furniture, many pieces designed by the famous furniture maker, Gustav Stickley. Great-grandchildren dubbed one rocking chair with slats on three sides, the "jail chair," because they had to sit in it whenever they misbehaved. Today, the Riordan's six-car garage serves as the Visitors Center. From here a tour through the Riordan Mansion takes visitors back to turn-of-the-century Arizona Territory and unexpected luxury and convenience in a home built when Flagstaff was a rough and rowdy lumber mill town. To reach the Riordan Mansion State Historic Park from Phoenix, take Interstate 17 into Flagstaff until the highway turns into Milton Road. Turn right on Riordan Road. The park is at 409 Riordan Road, about two blocks on the right. If you are traveling on Interstate 40 into Flagstaff, exit 195 puts you northbound on Milton Road. Turn right on Riordan Road. The park is at 409 Riordan Road, about two blocks on the right. There are picnic tables and an interesting self-guided walk around the grounds. Look for Native American totem carvings in the ends of the mansion's protruding logs, animal carvings hidden in the rock fountain, and the Hopi good luck tile under the entrance archway. The Visitors Center offers a slide show, photographs, exhibits and a children's "touch table" that challenges adults as well as youngsters. Both stories of the mansion are open to visitors, but only the first floor of the mansion is wheelchair accessible. The slide show in the Visitors Center features the second story rooms. Summer hours (end of May-Oct) 9:30 am - 5 pm. Guided tours on the hour start at 10 am; last tour at 4 pm. Please call ahead; reservations are recommended. 928-779-4395. Winter hours (Nov-April) are 10:30 am - 5 pm. Guided tours on the hour start at 11 am; last tour at 4 pm. Reservations are recommended. Call 928-779-4395. To learn more about Riordan Mansion online, visit Arizona State Park's web site at www.azstateparks.com. Janet Farnsworth is a freelance writer who specializes in Southwestern history and travel. She lives in Snowflake, Arizona, when she is not on the road exploring the wonders of the region. Photos courtesy Arizona State Park System.